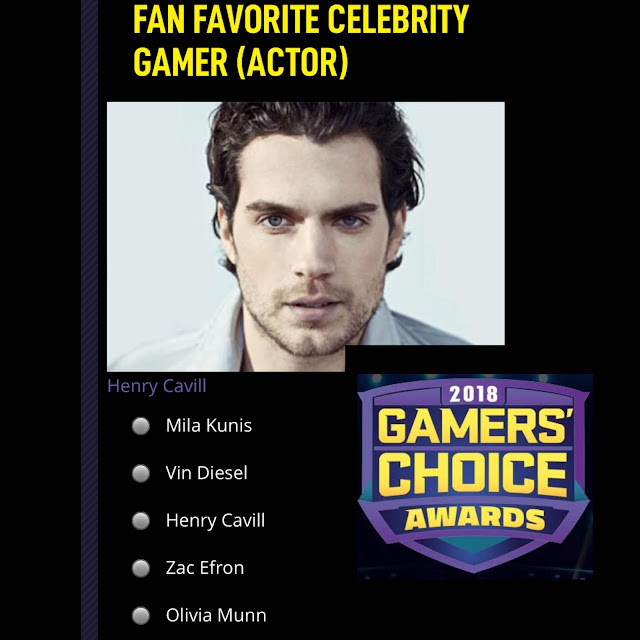 Henry Cavill News: Gamers' Choice Awards: Vote For Henry! Gamers' Choice Awards: Vote For Henry! The first ever Gamers' Choice Awards are set to air on CBS December 9th, and Henry has been nominated as Celebrity Gamer! Henry is known for his love for online games, sharing the now famous story of how he missed Zack Snyder's call letting him know he'd been cast as Superman, because he was playing World of Warcraft. So now it's our turn to make sure he gets rewarded for his gaming passion! "Fans can vote for their favorites at gamerschoice.tv now through November 27, where there is the complete list of nominees. The GCA’s are the only 100% fan-voted Awards Show in the world of gaming." Again, the winners will be announced at the 2018 Gamers’ Choice Awards on CBS -- set to air Sunday, December 9th from 5:00pm – 6:00pm EST. It's cool...now that he's The Witcher =D =D.